With the A-S2000 and now the A-S1000, Yamaha has taken the bold step of using a floating balanced configuration to update the power amplifier for serious music fans. This method, which is completely different from the pure complementary circuit that has been the main type used for the past four decades, features identical polarity on the plus and minus side of the output stage. 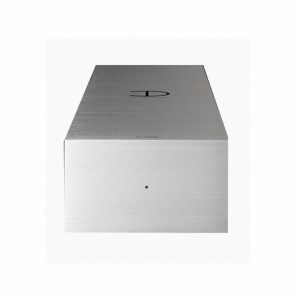 By completely isolating the plus and minus sides of the left and right channels of both the NFB and power supplies, it achieves perfectly symmetrical operation in the output stage. 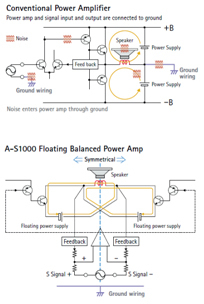 The use of four sets of floating power supply units (not connected to earth), provides further operating precision. 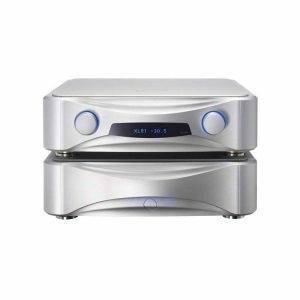 The result is very low levels of noise and distortion for exceptionally pure and transparent sound quality. Conventional audio amps have the volume and tone control circuits arranged in series (in line); when the tone controls are used, the signal route becomes more complicated, which can lower sound quality. 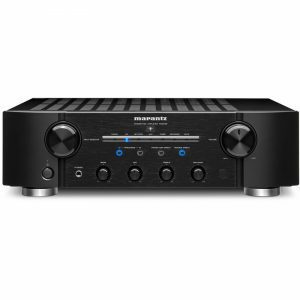 Many high quality amps therefore have a default circuit that can be selected to bypass the tone controls, but this forces you to choose between tone control and optimum quality. 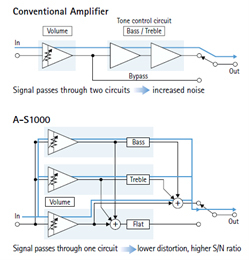 The A-S2000 and A-S1000 are the first amplifiers to avoid this problem by employing triple parallel electronic volume and tone controls, providing maximum sound quality even when the tone controls are used (signal goes through fewer ICs, so there is less noise). 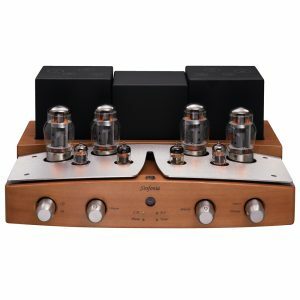 When the tone controls are set to the centre position, the passive element used for tone control is bypassed, so the three volume elements connected in parallel operate solely to drive and control the volume, for more efficient use of the power output. Each volume element is an ultra-high quality device and an analogue potentiometer is used to provide a very smooth operating feel. Power is provided by four large capacity power supplies that are completely isolated from earth. In the preamp stage, the combination of a low-current circuit that prevents the occurrence of noise due to current fluctuation and 12 shunt regulators supply all stages with clean and stable power. 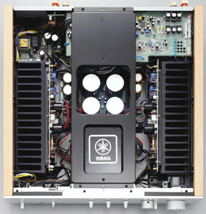 The extra-large power transformer, the carbon sheath block capacitors and other parts that directly affect sound quality were chosen only after extensive testing. 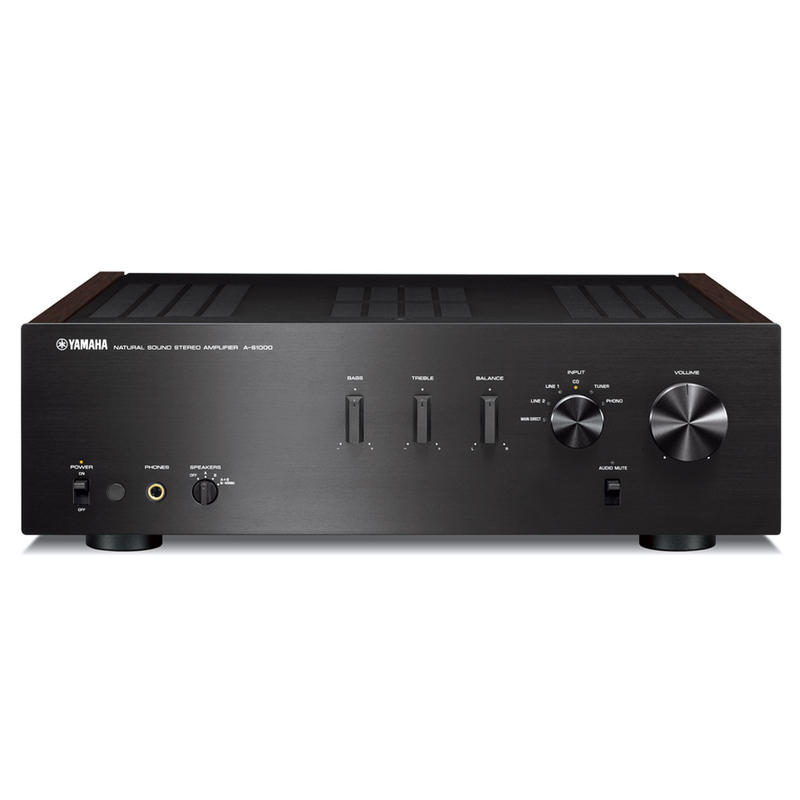 Although it is an integrated amplifier, the A-S1000 has a completely left-right symmetrical construction that makes it virtually the equal of separate amps. A central reinforcing bar ensures that the chassis is totally rigid.